Why You Should Be Using a Modern Microsoft Sharepoint Site for Flexible, Fast, Mobile-friendly Networking. Classic Sharepoint has been around since 2002, and, unfortunately, like most software built for simpler times it has been added to, patched and layered over until it has turned into an outdated and bloated beast. Enter the modern age! Last year, Microsoft unveiled a truly innovative and useful solution to classic SharePoint's woes. With the introduction of better-designed “modern” Sharepoint pages, users can now easily build convenient and attractive pages that don’t require thousands of hours of construction or an advanced degree in web development to create. Modern Sharepoint is less of a SharePoint upgrade and more like an entire new user experience. It solves many of classic Sharepoint’s usability headaches while providing a cleaner, more mobile-friendly look with enhanced features. Do you want to build a communication site for sharing published information on your company intranet? With modern SharePoint, you can create a great looking site that adapts automatically to any screen size with no advanced customization or configuring required. That employee banging their head on their computer screen for an hour? They've been trying to move a file in SharePoint classic. Due to classic SharePoint file organization structure, moving files was a difficult process. Modern SharePoint addresses this concern by giving lists and libraries more flexibility and a fresh look. You can also use Microsoft Flow to create workflows like matching Sharepoint file names to titles. The modern doc library looks fantastic on a smartphone as well. No more squinting at microscopic text to try and find the file you need. You can now easily select the file you want to use with a quick tap of your finger. Where the new modern SharePoint really shines is in its easy editing capability. Business users can arrange items where they want on the page and create a great looking website in minutes. Modern SharePoint is currently available online. You can create a modern team site or communication site. Lists and libraries are always modern view on both. If you’re not ready to fully migrate from your classic site, you can also add a modern homepage to your existing site-and instantly gain more advantages and functionality. - It’s faster. Classic SharePoint often taxed the servers it was created on. With modern SharePoint’s framework being hosted outside of SharePoint servers and web pages created right in the web browser, everything is quickly cached right on the user’s computer and loads as fast as an installed program. - It’s flexible. Modern SharePoint isn’t constrained by the hierarchies that classic SharePoint used to organize site contents. Hierarchies were inflexible and difficult to change. Modern SharePoint is built to scale as organizations change. - It has new features. Microsoft has developed some cool new tools that only work on the new modern site. 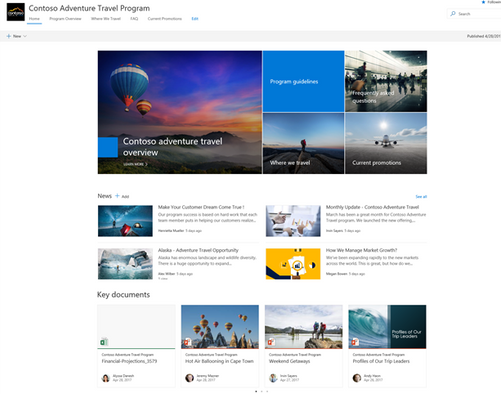 From newsfeeds that automatically distribute links to pages to the ability to embed a video and play it directly from your page, modern SharePoint is designed to store, show, and share better. - It’s more secure. A classic SharePoint site will run any script you put on it-even one that gathers private information about users or approves actions without permission. These sneaky scripts won’t pass on a modern SharePoint site with a few configurations your IT support team can easily provide. Microsoft Teams is revolutionizing office communication. However, there are still a lot of questions from users about when to use Teams or when to use something more robust, like SharePoint? The modern desktop that Microsoft keeps enhancing is not meant to be an either/or environment. Microsoft has created a host of programs designed for managing projects. For example, when you set up a new Team-a SharePoint Team site comes with it. 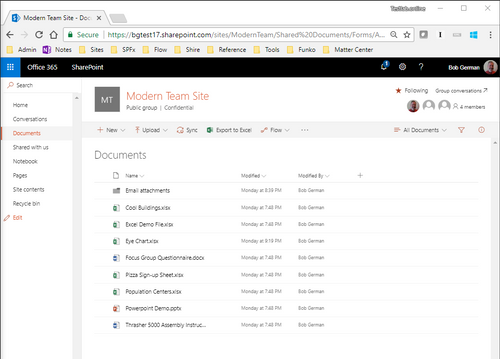 To access a Team’s SharePoint site, open that Team’s channel, click on the “Files” tab, then click “View in SharePoint.” This feature gives each Team within your organization its own custimizable website for better information sharing and collaboration. Conversely, any Team you already use can easily be added to your modern SharePoint site. More integration features between Teams and modern SharePoint are planned in the future, so get ready by experimenting with cool ways to use them together today. The SharePoint/Teams integration is just one example of the Office Graph-Microsoft’s vision for how content and activity can seamlessly interact across the whole Office suite. The goal is to better connect people to the content, conversations and collaborators around them. If you are an Office 365 subscriber, you can start using modern SharePoint right now. Visit the SharePoint homepage, click "+ Create Site" and select a modern Communication or Team site to get started. If you need Office 365, or if your business is overdue for a modern data migration, give us a call today! We’re happy to help. Teams vs. Slack - What's Better for Your Business?